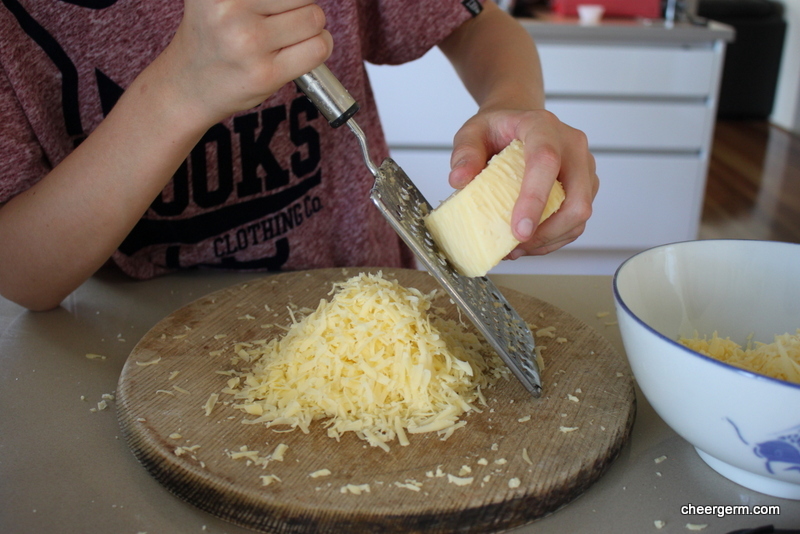 In an attempt to involve our kidlets in the cooking and ‘not just eating process’, a decree has been passed in our household (royally of course) that ‘each child shall take turn-a-bout choosing and cooking Sunday’s dinner with their Mum’. We took a respite from this over the Christmas and school break but once those holiday shenanigans ended we began again. This mother of two boys is determined to ensure that our lads eventually leave home (albeit in their early thirties) with the ability to cook a decent repetoire of dishes. 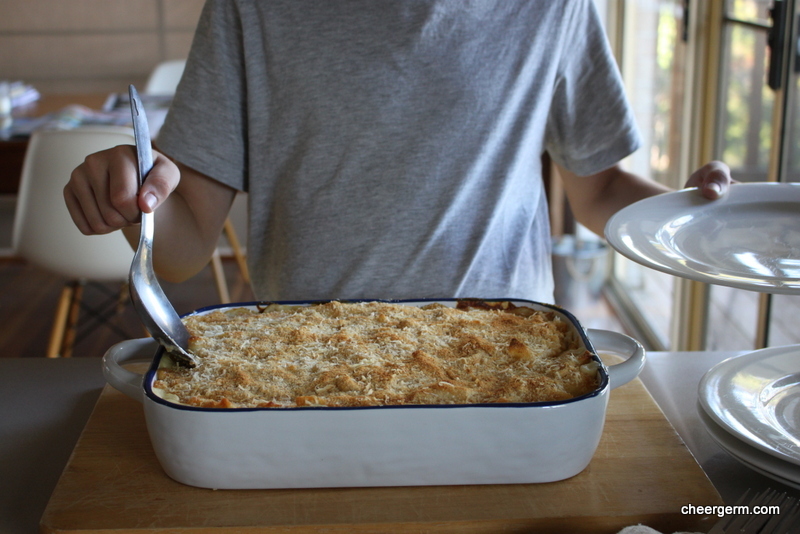 Kid 1, on the cusp of turning 14, decided that after watching Rick Stein cook up a decadent version of Mac n Cheese (Macaroni and Cheese for those that may not know), that this would be the dish for him. We have since renamed it ‘Heart Attack on a Plate.’ But my, how very delicious it was. To save precious energy (I am old and he is, well, an adolescent), we decided that the dish had to be entirely gluten free and vegetarian. Frankly, we couldn’t be arsed bothered making two different versions. And guess what, none of us cared. 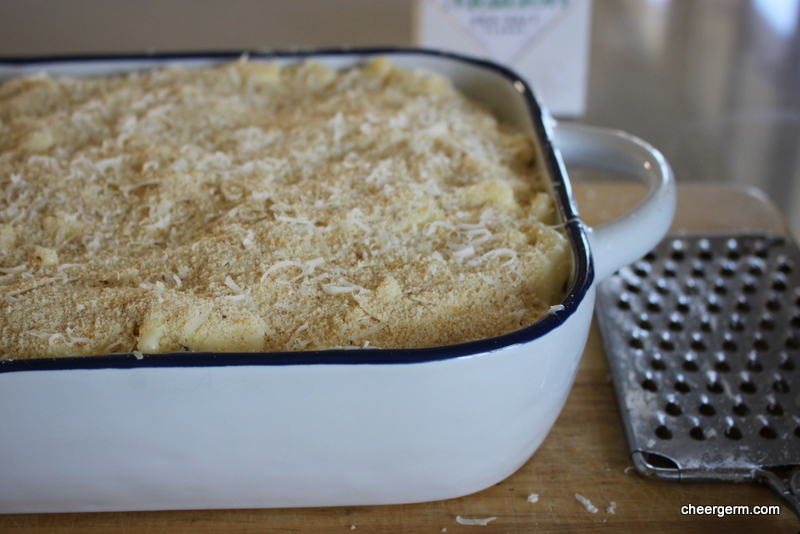 Preheat oven to 200C (or 180C fan-forced) and grease a 35x20cm ovenproof dish. Melt the butter in a medium size saucepan then stir in the flour and cook for two to three minute until the mixture (roux) starts to bubble. 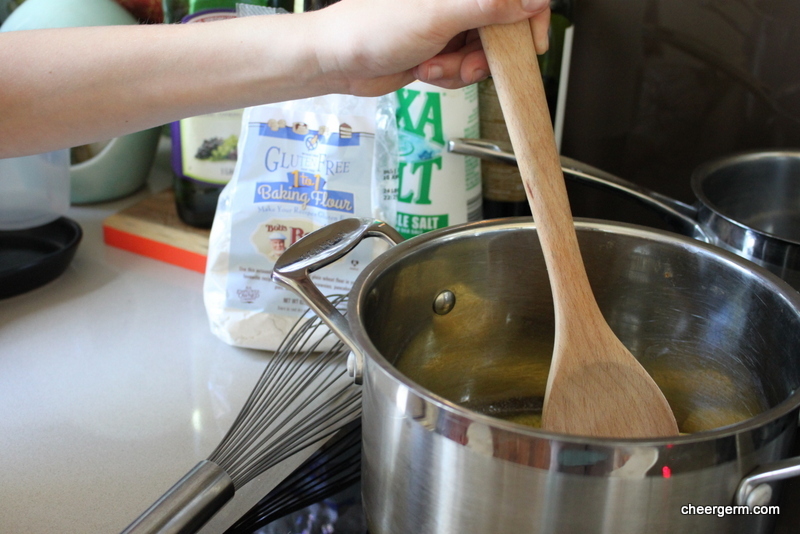 Add the mustard and remove the pan from the heat, add the milk, cream and bay leaf and quickly whisk together. Return the pan to a medium heat and continue to stir constantly until the mixture starts to thicken and boil. 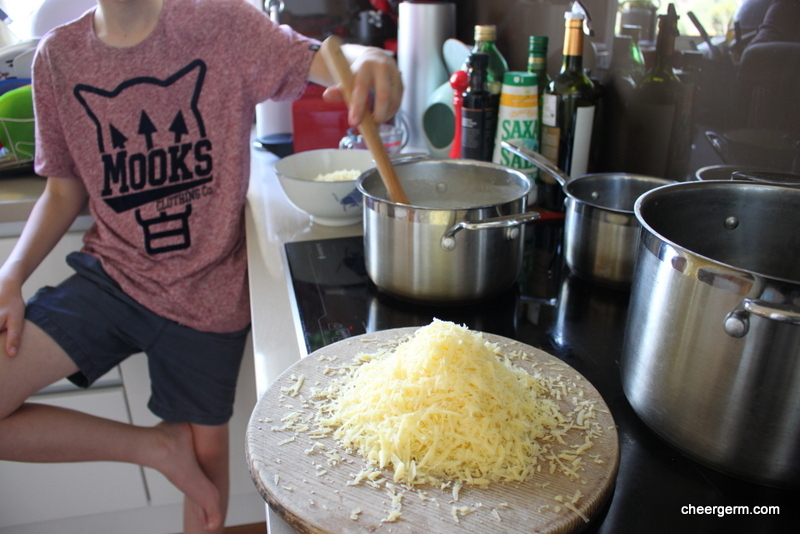 Remove the saucepan from the heat, remove the bay leaf and add the cheddar. 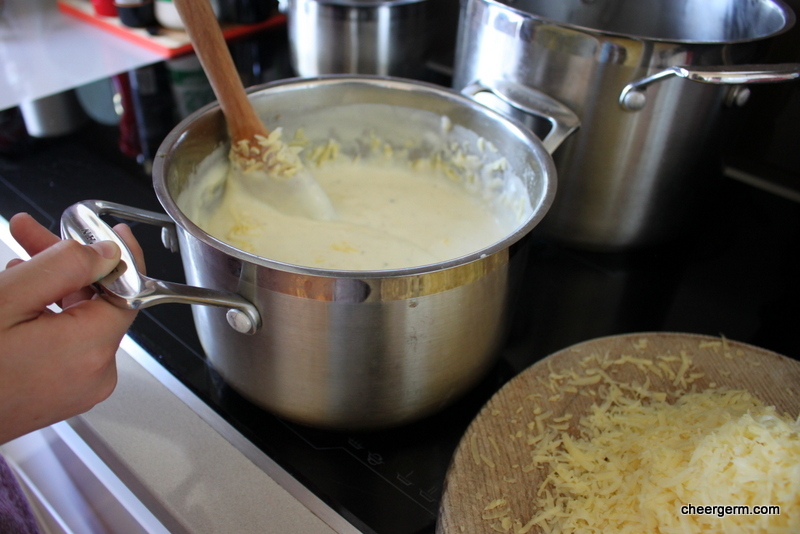 Stir until the cheese has melted then season well with black pepper and nutmeg. Bring a large pan of salted water to the boil and cook the macaroni until al dente as per the packet instructions, usually around 8-10 minutes. Drain and add the pasta to the sauce. Pour the mixture into the ovenproof dish. 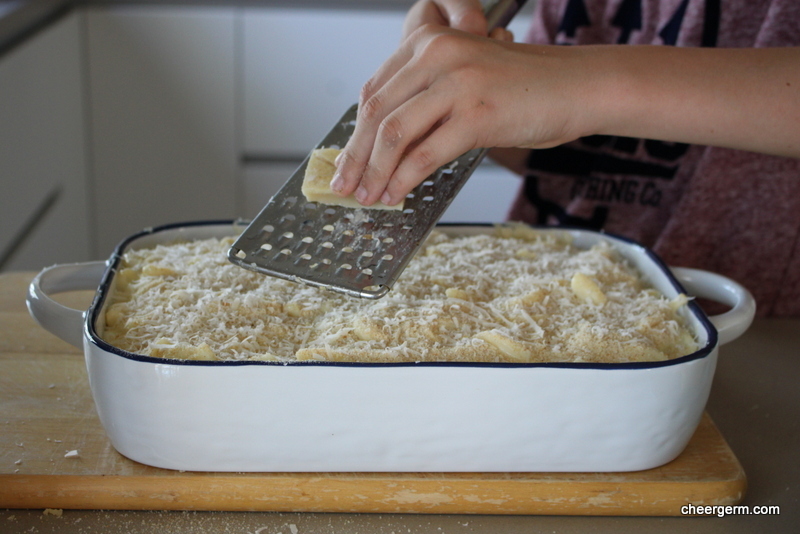 Mix the breadcrumbs and Parmesan together and sprinkle over the top. Bake for 30-40 minutes until golden brown and bubbling and serve immediately. Cooking Notes: Choosing a decent gluten free pasta is a veritable minefield, to avoid too many white starchy carbohydrates I will often use a buckwheat pasta for The Yak. For this recipe we used a generic supermarket brand corn and rice pasta which was actually OK but that was only because the people in my life cannot follow a simple shopping instruction. Thus far, the best ‘most like wheat based pasta’ gluten free pasta I have ever purchased, is the fairly new gluten free Barilla pasta range. I am not paid to say this, nobody pays me to say anything, although I wish they would. I would also happily be paid not to say anything at all. I am open to all offers. A slight adaptation of a Rick Stein recipe. Go here for the original non-gluten free and non-vegetarian recipe for those of you who don’t have to care. I never usually comment on my photos but I had to state that this photo cracks me up. Our lad is standing in exactly the same way that I often do. It is also the same way that my physio has told me off for as it is not good for your spine alignment. It seems to be that very little in this post is actually ‘good for you’ but frankly, cest la vie! This entry was posted in Family memories, Gluten free main courses, Main Course Dishes, Vegetarian and tagged celiac, cheergerm, coeliac, cooking with kids, gluten free, gluten free mac n cheese, gluten free macaroni and cheese, mac n cheese, macaroni and cheese, rick stein, Vegetarian. Bookmark the permalink. OMG! Healthy shmealthy. If it’s not fat, it’s carbs. Carpé diem, I say. Seize the cheese! 😉 Love the photo of kid 1 naturally doing a yoga pose I can’t quite manage. He is well on his way to becoming a chip off the old Cheergem! First of all, WELCOME BACK! I applaud you for starting in early with the cooking lessons. This is something they will never forget and think of every time they make this fabulous meal. What a yummy legacy! I’m more than a little lactose intolerant and alas, Mac ‘n cheese would destroy me though if someone made this in my house I’d risk a spoonful. Thanks Susanne. I finally got my act together and pressed the Publish button. Yes, I hope it creates some lasting memories and skills. Bummer for you on the lactose issue, I just get terrible reflux from too much dairy. This recipe would really do a number on you but oh my, it did taste good. Cheers! Thanks to Rick Stein and our culinary skills, it was! C’est la vie all right, Lisa. 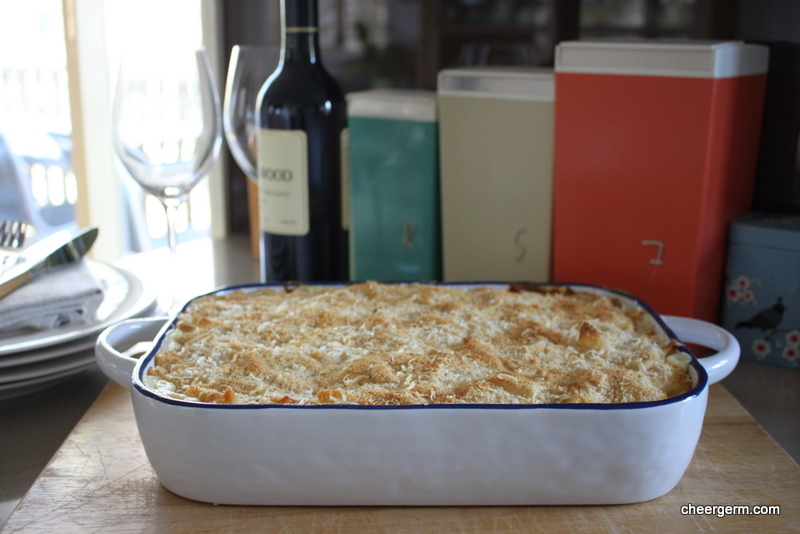 This dish brings back youth hostel memories of me and the granddaughters whipping interesting things up in the communal kitchen. 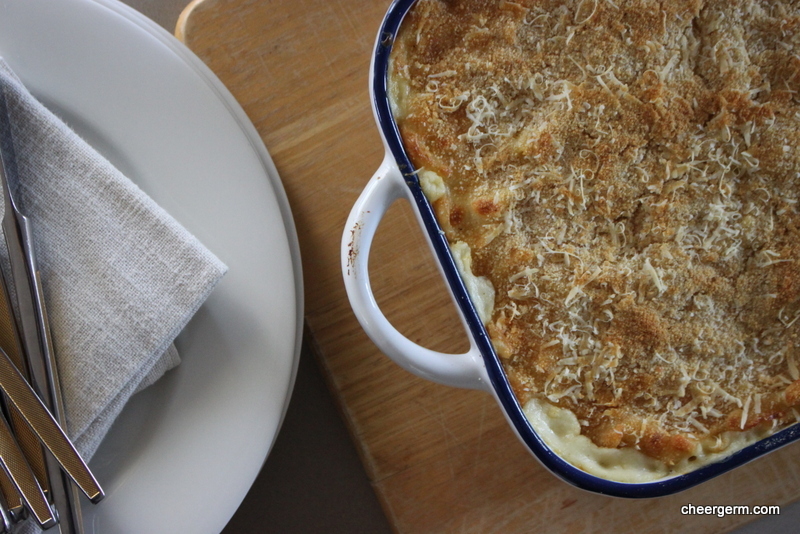 Cheese and Mac at the end of an exhausting day was an easy favourite. Glad you’re back. It’s tops to hear that the effort pays off in the end and the process is certainly a special memory no matter what happens to their cooking skills or lack thereof I guess!? That soup sounds delish, is it on the blog? no not yet Lisa but I’ll write it up one day. Well, I love anything that starts with a white sauce! Love the photos. So smart to get the kids cooking.